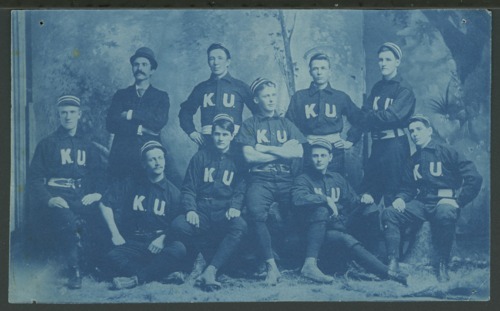 The 1892 varsity baseball team at the University of Kansas is pictured in this cyanotype. The image was published in Quivira, the university's 1893 yearbook. Team members are identified as follows (from left to right): standing--M. W. Sterling (manager), W. H. Piatt (center fielder), Jim Harding (sub), Archie Hogg (second baseman, captain); seated--Lieurance, Wilbur Kinzie (pitcher, third baseman), J. C. Kelsey (catcher), A. F. Sherman (pitcher, third baseman), M. L. Alden (right fielder), Bryce Crawford (shortstop).